Our team has comprehensive healthcare knowledge, including behavior modification in healthcare providers, enabling training transfer from simulation to clinic. Founded in 2006, Medical Cyberworlds, Inc. (MCI) is a Wisconsin-based company in the digital healthcare/modeling and simulation space. 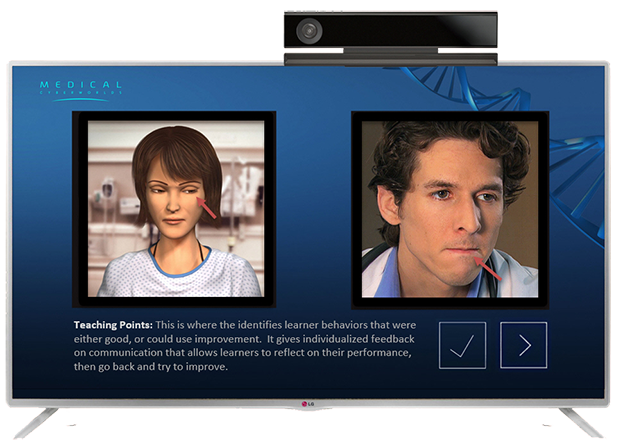 MCI uses its patented virtual human technology to train healthcare professionals to communicate strategically and empathically, with patients, families, and with one another. This is a critical and currently unmet need at all levels of healthcare training and practice. MCI is the singular experience in the design and development of responsive virtual human characters that promote empathic engagement with learners. Our highly skilled team has comprehensive knowledge of the healthcare field, including behavior modification in healthcare providers, enabling training transfer from simulation to clinic. In addition, our team has extensive experience creating evidence-driven, effective and practical virtual human-based healthcare training that promotes experiential learning, reflection, and deliberate practice in a range of situations, including high-stakes, emotionally charged encounters. MCI products are designed by physicians and healthcare education experts, working along with a multidisciplinary team to solve healthcare problems in practical, effective, and evidence-based ways. We hold the only patents granted for virtual human technology in healthcare applications. MCI recently published the preeminent peer-reviewed research manuscript on virtual human simulation for training advanced communication skills in healthcare. MCI’s system is effective for training advanced (verbal and nonverbal) communication skills. MCI’s system enabled training transfer into a more realistic clinical situation. Users found MCI’s system engaging, useful to learn nonverbal behaviors, to prepare for stressful patient encounters and preferred it to standard methods. Mpathic-VR’s™ virtual humans promote empathic engagement with users. There are no comparable data supporting the use of any other simulation methods (human or virtual human) to develop advanced (verbal and nonverbal) communication skills. Our Patented Virtual Human Technology-Based Communication Training Technology Is Easy To Use, More Immersive, More Effective And More Affordable Than Current Training Methods. An Improved Patient Experience And Reduction In Medical Errors Will Result In Greater Revenues And Reduced Costs For Medical Organizations.